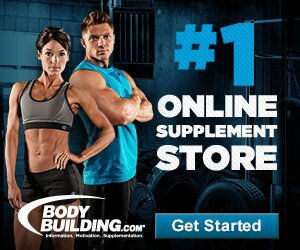 Comprehensive review of Nature's Bounty Complete Protein Shake. See what real experts and actual users have to say about this protein powder. 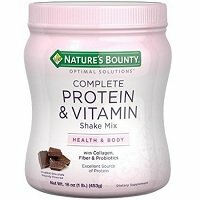 Nature’s Bounty Complete Protein Shake comes in at 1.5 out of 5 stars. Unfortunately, this product just totally misses the mark in some very important areas. This protein shake is designed specifically for women and to support multiple areas of the body both inside and out. So, I really like the additional vitamins, minerals, and nutrients included in this mix. It has quite a few unique ingredients such as probiotics, collagen, fiber, B vitamins, Vitamin C & D, flaxseed, calcium, digestive enzymes, and electrolytes. These help support bone health, immunity, digestion, hair and nail growth, and healthy skin. I like products that kill two birds with one stone. You’re getting a ton of great nutrients that your body needs along with a daily protein boost. However, the protein levels and sources aren’t good at all. It only has 15 grams of protein per serving (2 scoops) and uses a “proprietary protein blend” of soy protein isolate and whey protein concentrate. I hate blends because you have absolutely no idea how much of each protein they used. And soy protein isn’t a good quality and whey concentrate isn’t that great, either. Also, I’m not a big fan of this flavor. It tastes like dark chocolate, so a rich cocoa taste but slightly bitter. I’m disappointed because I couldn’t find any kind of satisfaction guarantee. Overall, it had potential to be a multi-facetted protein powder but it drastically fell short on the protein side of things, which is why we’re here to begin with! This protein shake is easy to use. Just mix 2 scoops of protein with 8 fl. oz. of cold water, skim milk, or milk alternative. Shake or blend for about 10 seconds and you’re good to go. The consistency is smooth and doesn’t have any chunks. The scoop handle is a little small, which made it a little messy at times but that might just be me. I got this protein shake in the Decadent Chocolate flavor. It tastes like semi-sweet dark chocolate. It has a rich chocolate flavor but without the sweetness. The flavor is ok with water but tastes a lot better with milk or almond milk. If you like chocolate but don’t have a sweet tooth, you might like this flavor. For the macros, this protein shake has 15 grams of protein, 3 grams of fat, and 11 grams of carbs per serving (2 scoops – 33 g). There’s 6 grams of fiber, so that brings the net carbs down to 5 g.
It has 110 calories per serving. Nature’s Bounty Complete Protein Shake has quite a lot going on in the ingredient profile. First and foremost, it has 15 grams of protein per serving. The protein sources are in a proprietary blend of soy protein isolate and whey protein concentrate. Unfortunately, these are not high quality proteins. Soy protein isn’t anywhere near as effective as whey protein. And whey concentrate is inferior to whey isolates and whey hydrolysates. So the protein quality and amount is very low. There are many added vitamins, minerals, and nutrients. These additions help support areas like bone health, digestion, immunity, hair and nail growth, healthy skin, and energy metabolism. I didn’t have any negative side effects while taking this protein shake. I felt full after drinking it but not sluggish or bloated. As a note, it does have soy and milk ingredients. This protein shake is best used for women looking to boost weight loss, tone up, or to maintain a healthy body. It states the nutrient blend addresses the key nutritional needs of women to help them look and feel their best. It’s specifically suited for women and the pink container helps establish that. The formula focuses on many areas like healthy skin, immune health, hair and nail support, energy metabolism, bone health, digestive health, hydration support, and muscle health. A 1-pound container costs $8.94 on Amazon. For some reason, this flavor was about a dollar cheaper than the other types. The container has about 13 servings and it comes out to 4.58 cents per gram of protein. That’s a super reasonable cost for protein. However, the quality of the protein isn’t great. It’s a decent value if you’re looking for extra vitamins, minerals, and things like probiotics and digestive enzymes to support more than just muscle health. I couldn’t find any type of guarantee on Nature’s Bounty website. I really prefer when companies can back their products with some kind of guarantee. This protein powder is sold in stores like Walmart and CVS Pharmacy and also online such as Amazon. Individual stores may have their own money back or satisfaction guarantees, or even just a return policy, so be sure to check that out. To buy Nature’s Bounty Complete Protein Shake, click here.